This entry was posted in Currently Reading . . ., On-line Author Conversations and tagged Buddha on a Midnight Sea, Buddhist Fiction, Francesca Hampton, short stories. Bookmark the permalink. Interesting question. I know, from friends who have reported back from fiction programs in colleges, that any remotely overt effort to include a message related to dharma or more generally “wisdom” is strongly discouraged these days – apparently to the point of labeling it heresy. Readers are to be left entirely alone to draw their own conclusions from your brilliantly evoked details of daily life. While I understand some of the reasons for this, and do find overly preachy fiction as unpleasant as most readers, I think we may have gone too far in this Spartan direction. Why do people seek out good literature if not in an attempt to go deeper into their understanding of life? When I think back to all the books and stories I have read, and even the movies I have seen, it was those who skillfully (uncloyingly) gave me some clue or even clear statements as to the deeper meanings of life and its possibilities that most moved me. Readings that simply provided entertainment or the enjoyment of a well-laid trail of words did not give me nearly so much joy. These particular stories, “Teachers” and “In the City of the Queen of Angels” reflect my travel days. I was part of that lucky subset of the baby boom generation that donned our post-college backpacks just as the Tibetan lamas, with their living traditions of 2400 years of Buddhist practice still intact, were forced out of “forbidden” Tibet and came down from the Himalaya and into India as refugees. It was an encounter with seismic repercussions for thousands of us and certainly a landmark moment in the history of Buddhism. We found ourselves in a situation with the rare freedom – so hard to come by in modern life – to sit for long periods and really take in and try out the ideas and techniques the lamas wanted so urgently to pass on, and I think we came away with much worth sharing. A few former “travelers” have become truly worthy teachers in their own right. Many more are now advanced meditators or scholars or administrators of new Buddhist centers all over the world. I am none of these, and yet I saw and heard some extraordinary things in those days and putting some of them into these stories is my own way of sharing what I hope may be of benefit to others, if only to serve as signposts pointing to what is possible. In “Teachers,” readers can get at least a simplified taste of the Tibetan practice of the visualization of Chenrezig, the Bodhisattva of Compassion, and of the profound and joyous motivation of Bodhicitta, a stable, realized commitment to dedicate all one’s energies to the benefit of others by helping them toward Enlightenment. This motivation is the foundation of all Mahayana Buddhist practice. There is also a brief presentation of the simple but powerful meditation of tonlen, “the golden teaching” that helps one develop Bodhicitta (and which the Indian saint Atisha traveled all the way to Indonesia and prepared for eight years to receive.) There are also dangers in Tibetan practice, and I hope the character of the crazed American may serve as some kind of warning for those hoping to practice without any guidance from a teacher. These meditations, wrongly done or done with the wrong motivation, can and do sometimes lead to out of balance mental states or even open the door to longer term mental illness. “In the City of the Queen of Angels” also explores the profound experience of the Tibetan practice of visualization, in this case of the female Buddha Tara. It is a practice in which a practitioner ultimately imagines him or herself as already Enlightened – and within the body and mind of a Buddha (fully awakened being), able to help others directly. The idea is not to believe in a delusion, and certainly not to inflate one’s ego – the meditator knows he or she is only pretending – but in the process of pretending, lo and behold one does strengthen, little by little those qualities of compassion and focused attention and wisdom that will get you there in the end. The main character here is a very damaged woman, a former backpacker to Asia, who is greatly healed by her lonely practice of Tara. She has had few teachings, and has lost the teacher she initially has, yet, like the story of the mother of the Tibetan monk who realized Tara while saying the mantra wrong for many years, she practices with such devoted concentration that she makes far more progress in one life than most ever hope for. I agree. No one likes anything that is preachy, but dancing the line between preachy and sharing wisdom is easier if your story is set in a Buddhist culture, or is a clearly Buddhist story. Readers expect Buddhist wisdom in a book with Buddha in the title, so you have more leeway than in a story set outside of that context. I make life hard for myself writing outside that context and it took me a long time to find the balance. You are dealing directly with the same kinds of things that I do, but in an indirect metaphorical way. You certainly have a point, Tahlia, it is a balancing act and placing the stories within a Buddhist cultural context certainly makes it easier. That said, I remember back to a book I stumbled across as a teen (the title is long gone from memory, drat) that just transfixed me with what I later was able to recognize as a glimpse of “satori” in zen terminology, or “grace” in Christian terms. It was simply the story of an abused child who was locked in her bedroom with no food for a long time and reached a state of transcendent focused joyful seeing as she sat so long with no outside stimulation. I had never heard of such states at that age and it did much to give me my first understanding of what the word “spiritual” might mean. Another author who managed to put wonderful spiritual lessons into his writings for children was the late Malcom Bosse. Take a look someday at his remarkable book, The Seventy-Nine Squares. He managed to incorporate Buddhist and Hindu practice insights into several of his books. That definitely answers my first question, thank-you Cesca! When I was reading “In the City of the Queen of Angels” I was thinking about the visualization you guide the reader through in the story. It made me think of a puja for Green Tara that I was given by a conference colleague. The puja was used by a feminist group in Australia and emphasized the active elements of Green Tara. After reading “In the City of the Queen of Angels” I re-read this puja and did not find a great resemblance to the descriptions you provided in the story. As I understand it, the puja from my colleague had a particular focus and agenda, so I wondered if there is a specific puja that was a foundation for your descriptions in the story? I can’t say why it may have been different. I was not following a specific puja, but rather the most common pattern for Mahayana visualization practice: Taking refuge in the three gems, setting one’s motivation, making offerings, the main practice with visualization, and then dedicating whatever merit has been attained in the practice to the happiness of other sentient beings and one’s own future Enlightenment. My own principle lineage of practice and teachings is Gelugpa. Those are the pujas I am most familiar with. Thanks for your answer Francesca! I have another question for you. I just re-read “Teachers” and, as always, it leaves me feeling comforted and wistful, like the wafting scent of lilacs on a warm spring day. I think this feeling is part of my own personal engagement with and benefit from the story, since I can identify with both the crazy Westerner and the student-status of Sherab. I wonder if you have ever had feedback on this particular story from someone who is not at all familiar with any form of Buddhism? If so, what did they think? Was the story received in a similar fashion to the way I received it or did they chalk it up to science fiction? I’m searching my memory, trying to remember any specific comments from non-Buddhists to this story – without any real success. It was one of the first out of the gate and was published long ago in the Sun Magazine of North Carolina, and later in two different anthologies, and has received some good responses. 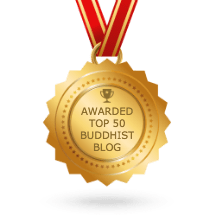 I think perhaps meditators in general can relate to it, because most of us have experienced that moment of shock when a meditation has been unusually rewarding and before we can catch it, our ego runs to take credit – oh what a spiritual prodigy am I! – and then something or somebody pops our bubble. Our meditations frustratingly go back to humdrum again. Or a teacher scoffs at our pretensions – as good often teachers do. They may also like the reminder that Buddhas cannot save us with magical efforts, only teach us how to begin to wake up and see reality – and the way past suffering – for ourselves. The Tibetans really do encourage their students to be grateful to ordinary sentient beings, the more difficult the better, because without them, no mediator could amass the powerful karma of patience and compassion needed to make spiritual progress. “Your friends cannot teach you patience,” the Dalai Lama is fond of saying. Others may simply enjoy the exotic locale of a Tibetan refugee camp in Southern India and the sense of getting inside the experience of a religion they have only seen in images. No one has suggested the story is science fiction. The only person who did take exception to its accuracy was the chief attendant of the Lama on whom the old Rinpoche is based. He felt he would not have offered a kata in those circumstances. And no doubt he is right – that was a bit of author’s license to fill a need for a symbolic gesture without overloading the reader with words. Tibetans, as you may know, often give a lama they are approaching a white scarf (kata) as a symbol of all they would like to give as well as of their great respect and deference. He or she then gives it back, putting it around the supplicant’s neck, and they walk away content. Perhaps it would not be used in such a one-on-one encounter. But a few other parts of the story are taken directly from life. The baby water buffalo, for example, really did seem to take orders directly from the Rinpoche. He madly circumambulated him whenever he came out far enough into the yard, round and round. Truly startling to see. And he did fall into a ditch one day. My hands still remember the feel of his little body as I lifted him out. Thank-you so much, Francesca, for your willingness to answer questions about your short stories. Our discussion has been a fruitful experience and very helpful to me in my doctoral work. I hope that blog followers were able to read the short stories that you graciously provided through links and enjoy them as much as I did.